Cardinal Ippolito II d'Este was appointed governor of Tivoli by Pope Julius III. In September 1550 he decided to actually live in the town, but he soon felt that the governor's residence, a section of a Franciscan monastery adjoining S. Maria Maggiore, was unfit for a man of his rank. The palace he built on a section of the monastery did not introduce significant architectural novelties. 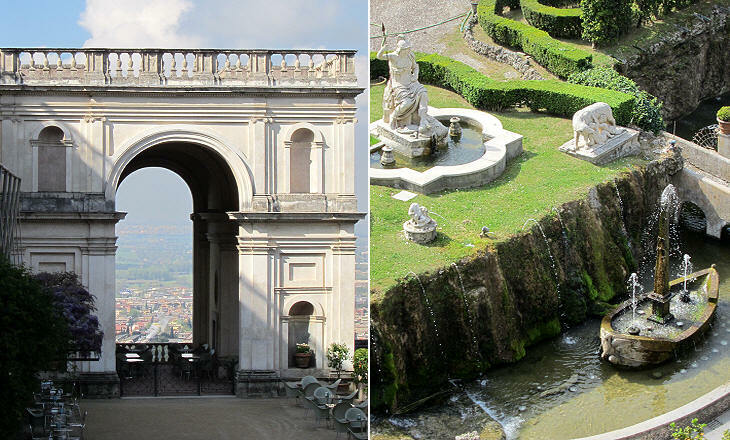 Its gardens lay on a steep slope beneath it and, owing to the ingenuity of their design and fountains, they became a model for those of the many villas which popes and cardinals built at Frascati and Castelgandolfo in the following years. In the mind of Cardinal Ippolito the gardens of Villa d'Este should have been a new Garden of the Hesperides, the nymphs who tended a tree giving golden apples which were stolen by Hercules (more on this in the previous page). 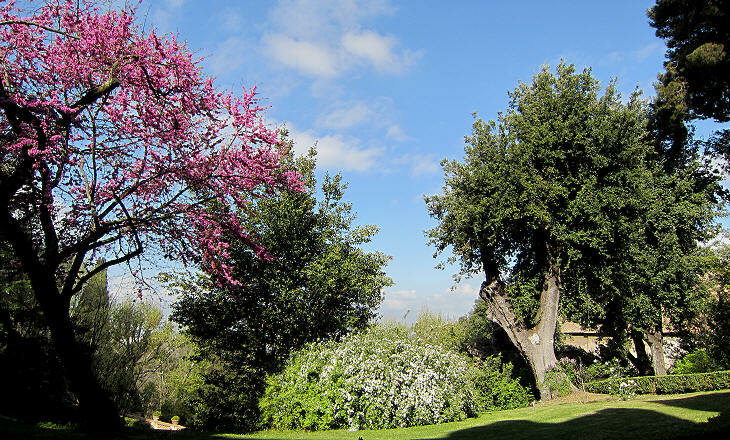 The cardinal's guests were expected to enter the gardens from a gate on the road from Rome. In order to give them the feeling of entering a magic place, a long pergola (a shaded passageway) flanked by rustic fountains, did not allow the full view of the gardens and of the palace. In the XVIIth century the heirs of Cardinal Ippolito chose a different approach: the pergola was shortened, lines of cypresses were planted and some changes were made to the fountains in order to create a long open view from the entrance gate to the palace and vice versa. This decision was influenced by developments in the urban design of Rome where very long roads ending with an obelisk were opened by Pope Sixtus V.
The feeling of being in a mythical garden of the ancient past was emphasized by statues (either original ancient statues or just similar to them), columns, reliefs, etc. 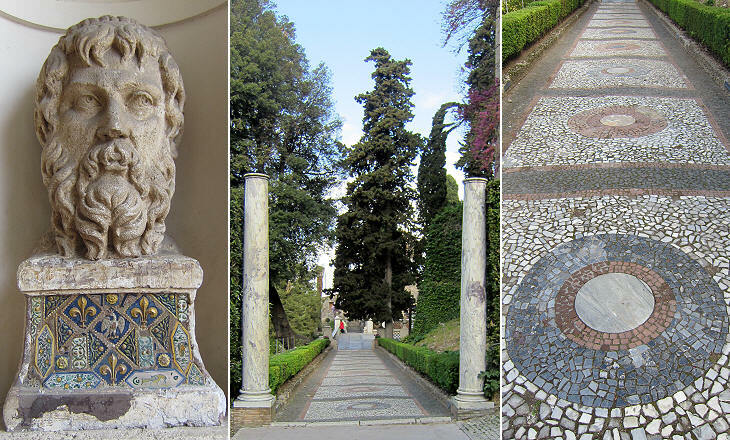 During the long period of neglect of the villa by the Este, works of art and marbles were sold or stolen. The restoration effort carried out by Italian authorities after 1919 has in part recreated the original decoration of the gardens. The series of fish ponds derive from Poikile, a very long rectangular pond along which the emperor loved to walk. On a more practical aspect the fish ponds provided Cardinal Ippolito who suffered from podagra (gout) with the only large section of the gardens which was not on sloping ground. The fish ponds were part of an axis which was perpendicular to that between the entrance gate and the palace. It was the most imposing part of the gardens, that which best showed the engineering skills of Ligorio's assistants: Alberto Galvani, who worked for the Este at Ferrara, Tommaso Chiruchi, who was involved in designing the fountains of Villa Lante di Bagnaia and Claude Venard, a French hydraulic engineer who developed the mechanisms for activating the fountains. The rooms of the palace faced north and they enjoyed a commanding view over the gardens and the countryside beyond them, but not towards Rome. For this reason Ligorio designed a sort of gigantic triumphal arch under which Cardinal Ippolito and his guests could dine (it was close to the kitchen) and watch the sunset over Rome. Because the Eternal City is rather faraway, a symbolic Rome (Rometta) was built immediately below the arch. It included a personification of Rome, the she-wolf and Romulus and Remus and a reproduction of Isola Tiberina. Cardinal Ippolito and Ligorio placed a fountain dedicated to Tivoli at the opposite side of Rometta. Because Tivoli was known for its waterfalls, the theme of the fountain is a waterfall having at its top a statue representing a Sibyl and more in general Tivoli. The pond surrounding the waterfall has an oval shape (hence the name given to the fountain). The background of the fountain is a sort of Roman nymphaeum which housed statues and a walkway - a pleasant place to linger during the hottest hours of the day. A statue of Pegasus was placed at the very top of the rocks, a reference to Hippocrene, the fountain where the Muses bathed which was created by Pegasus when its hoofs struck a rock on Mt. Helicon. 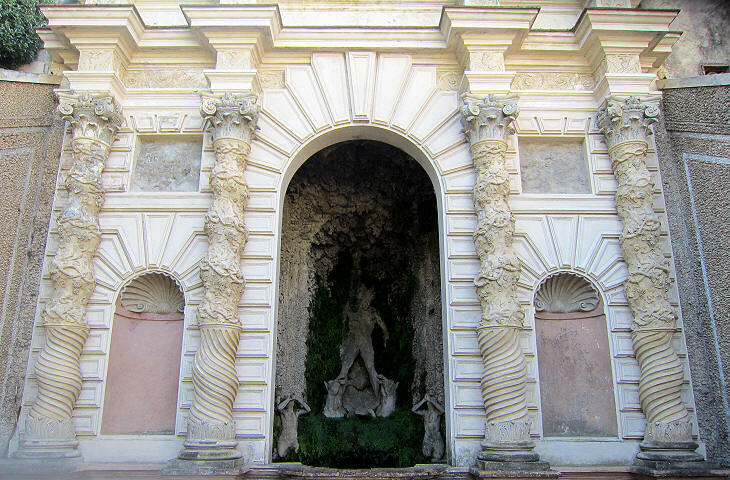 The design of this fountain became a model for the Teatro delle Acque, the name given to the main fountains of several villas at Frascati (see that of Villa Torlonia). 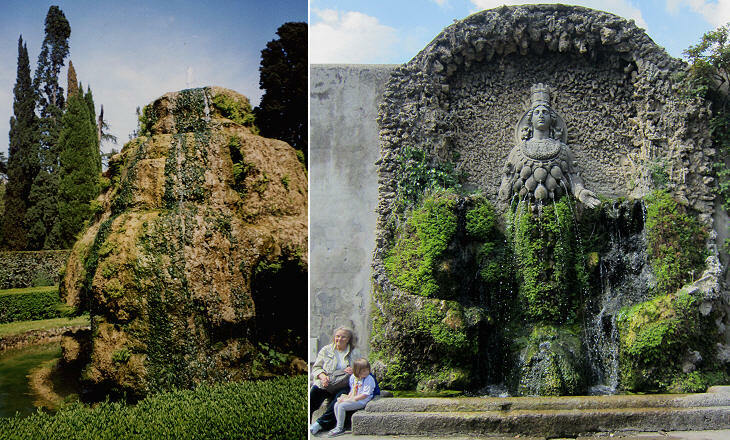 Rometta was supplied by water coming from Fontana di Tivoli. The duct carrying the water acrosss the gardens was meant to represent the Aniene River which after passing from Tivoli empties into the Tiber near Ponte Salaro. The river had two other names (Albuneo and Ercolaneo) and so Ligorio designed three parallel ducts with water spilling from one to the other. 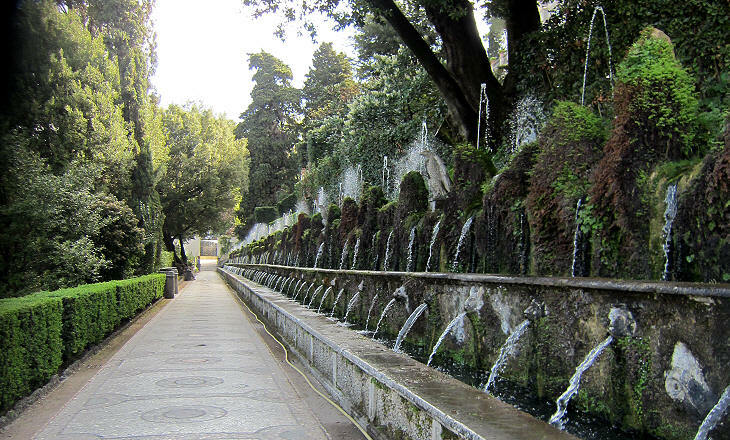 It is not necessary to know their symbolic meaning to be fascinated by Le Cento Fontane, the most photographed site of the gardens. The Garden of the Hesperides is mentioned in the Eleventh Labour of Hercules; it was guarded by a sleepless dragon and Cardinal Ippolito wanted to celebrate the Labour in a large fountain on the axis leading to the palace. 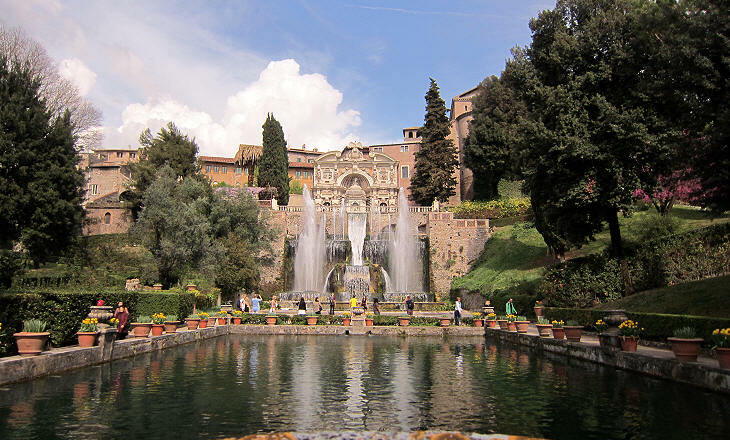 Pope Gregory XIII visited Villa d'Este in September 1572. He was impressed by the fountains and their mechanisms, much less by their mythological references. Cardinal Ippolito passed away a few months later and the villa was inherited by his nephew Cardinal Luigi who decided to turn the sleepless dragon of the Eleventh Labour into the dragons of the coat of arms of Gregory XIII. 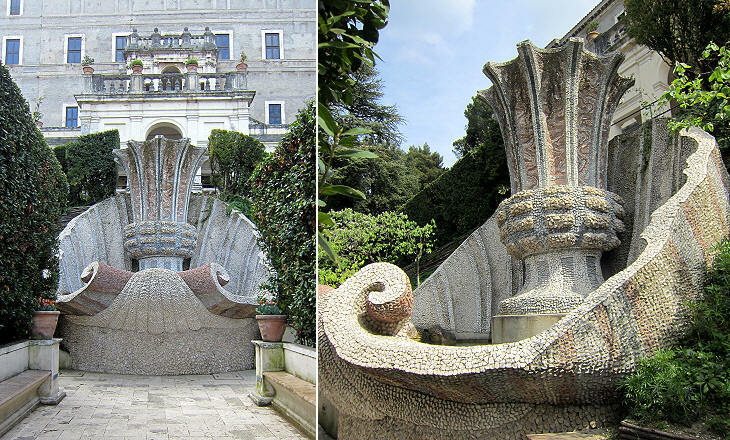 Villa Mondragone, which the pope started to build after his visit to Villa D'Este, has a similarly named fountain. Ligorio and his assistants had to work hard to develop a series of terraces on the very steep slope of the hill. 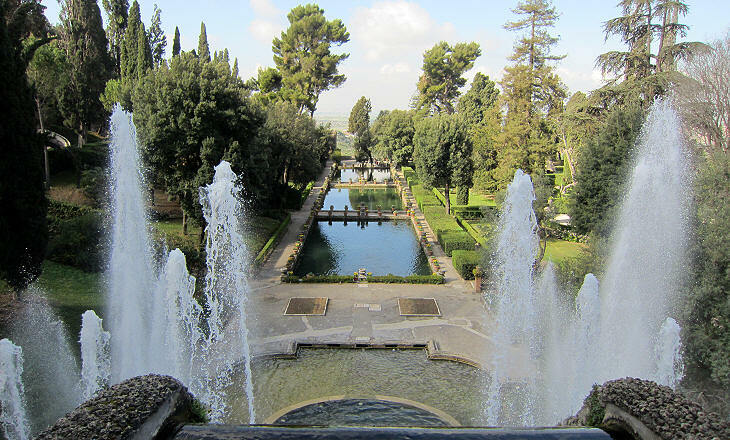 The bare walls supporting the terraces would not have been consistent with the elaborate decoration of the gardens and therefore Ligorio designed some fountains which were placed inside gigantic architectural frames. The spiral columns of Fontana di Plutone are almost identical to the bronze columns designed by Gian Lorenzo Bernini for the canopy of St. Peter's. Ligorio designed several grottoes, artificial caves which provided a fresh haven in summer. The decoration of these grottoes is called tartar because it resembles the incrustations formed by acid potassium tartrate on the sides of casks after the fermentation of wine. 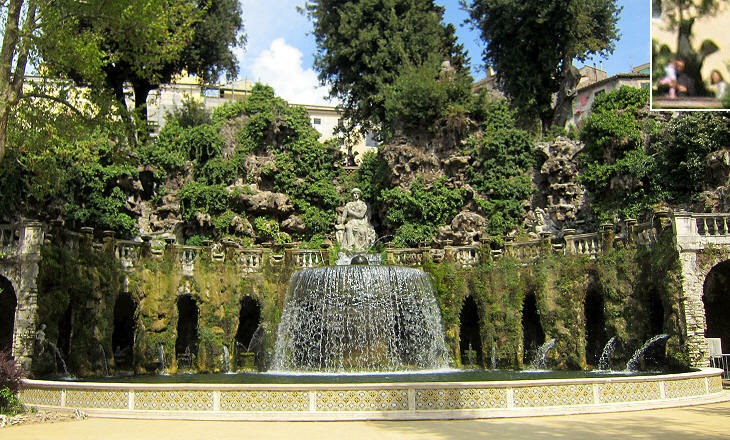 A famous example of this kind of decoration can be seen in the Boboli gardens in Florence. 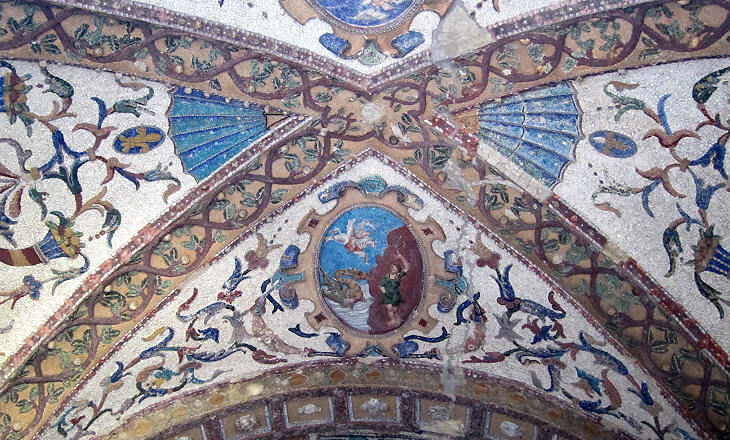 The grottoes were not aimed at recreating a real cave and they were decorated with paintings and mosaics. Those in Grotta di Diana illustrated some of the Metamorphoses of Ovid, a repository of subjects for Renaissance writers and artists. Andromeda was rescued by Perseus, who married her. At her death she was turned into a constellation by Athena. 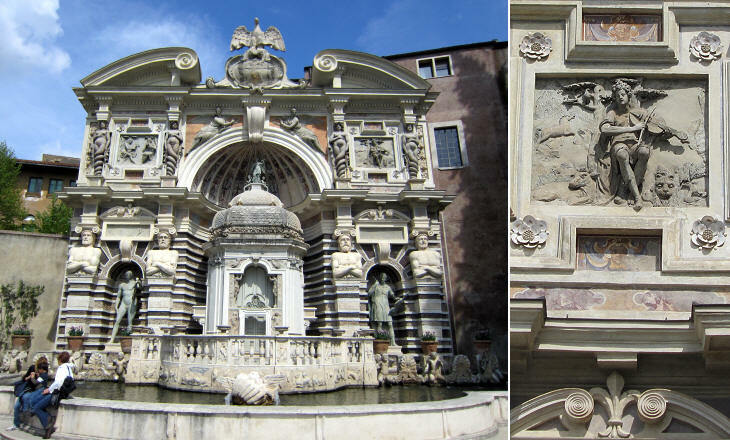 Fontana della Civetta (little owl) was perhaps the most celebrated jeu d'eau (water joke) of Villa d'Este: the fountain is partly lost and some painted wood panels help in understanding how it worked. The pressure of water was used to activate an organ which played tunes similar to the songs of birds (there were bronze birds on the two trees). At fixed intervals a mechanism brought an owl into the scene and, while the birds disappeared behind the trees, the organ played the doleful tunes of the owl. This complex mechanism was not aimed at entertaining children: maybe Cardinal Ippolito had in mind a few rhymes by Emperor Hadrian and he had come to the conclusion that these innocent jokes are what our soul will miss more. Nor will you make jokes as has been your wont! 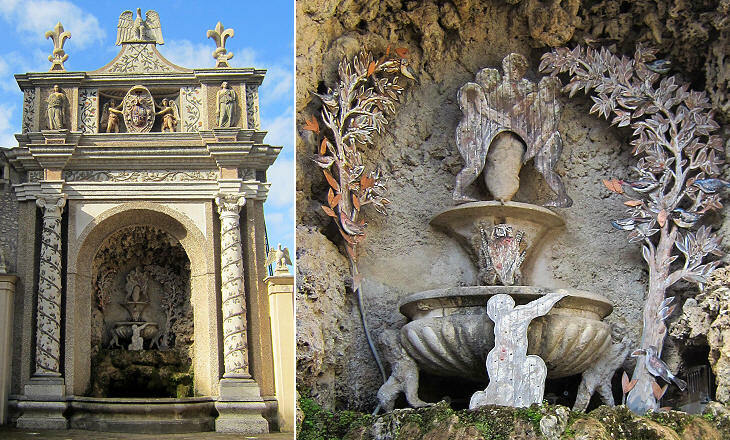 Fontana dell'Organo is named after an elaborate water-operated organ hidden behind its complex architecture. Its construction started in 1568, but it was completed only in 1611. In its initial design a statue was placed at its centre. It represented Ephesian Diana for today's archaeologists, but for Cardinal Ippolito and Ligorio it was a symbol of Nature and Abundance. In 1611 Cardinal Alessandro d'Este felt it was not proper to give such prominence to the statue of a goddess and he moved it to a remote part of the gardens. It was replaced by a sort of small temple. The organ was designed by Claude Venard and Pope Gregory XIII was so impressed by its sounds that he personally congratulated the engineer. 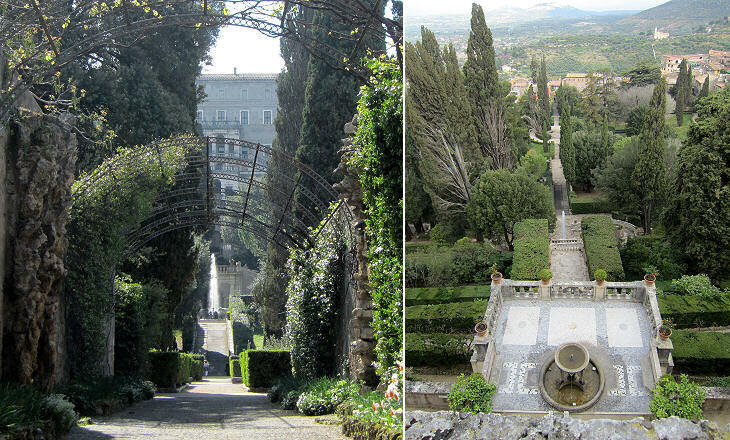 In 1851 Cardinal Gustav von Hohenloe rented Villa d'Este where he lived until his death in 1896. After a long period of neglect some of the fountains were reactivated. Composer Franz Liszt was among the cardinal's guests and in 1877 he wrote one of his most popular piano pieces on the different sounds of the fountains (Les Jeux d'Eau à la Villa d'Este). Meta sudante was the name given to a fountain built by Emperor Domitian; its ruins were still clearly visible in the XVIth century and Ligorio used it as a model for two fountains in the lower part of the gardens. Sudante means sweating because the water flows on the surface of the apparently natural rock as sweat does on the skin. The statue of Diana which was removed from Fontana dell'Organo ended up at the very end of the gardens. It is not an ancient statue as it was made for Villa d'Este by Gillis Van de Vliete, a Flemish sculptor known in Italy as Egidio della Riviera, who had in mind some small statues found in Roman villas such as that at Villa dei Quintili. When the heirs of Cardinal Ippolito decided to emphasize the axis from the entrance gate to the palace they found out that the two were not perfectly aligned. In 1661 Gian Lorenzo Bernini was asked for advice and he proposed to add a focal point between the gardens and the palace. The Bicchierone (big glass) had therefore a mainly architectural purpose. 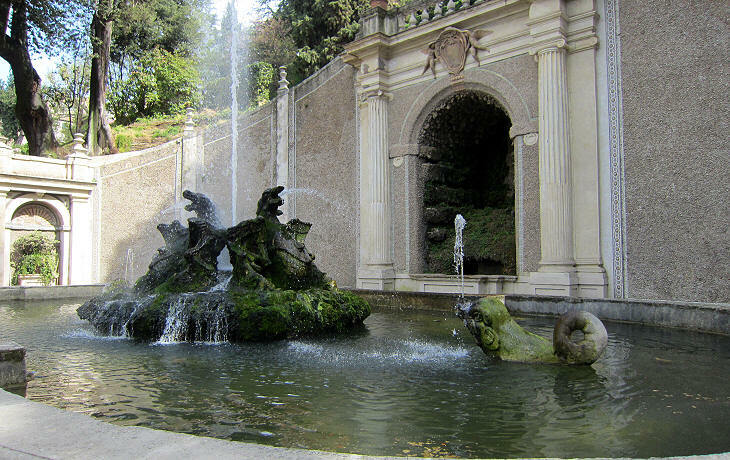 The fountain was thoroughly restored in 2009, so if you visited Villa d'Este prior to that year, at first sight you would think it is a modern addition. Click here to see Villa d'Este and Tivoli in the 1905 paintings by Alberto Pisa. You may wish to read William Dean Howells' account of his visit to Villa d'Este in 1908.